This strain is the holy grail of auto flowering growers, a true and pure auto-Sativa and one which has been described as a SUPER AUTO by its breeder stitch. 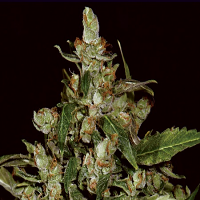 Super Cali Haze Auto Feminised Cannabis Seeds by Short Stuff Seeds: This strain is the holy grail of auto flowering growers, a true and pure auto-Sativa and one which has been described as a SUPER AUTO by its breeder stitch. 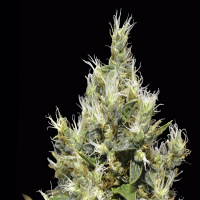 Stitch has been working for many years on refining an autoflowering haze strain but as many other breeders know this a very difficult and some say an impossible task. Stitch finally managed to do this when he created his ‘Nirvana sky’ strain and this has been used as the basis of super cali-haze. First a ruderalis was crossed with haze special and bred until it was 100% autoflowering. This was then crossed back with a resinous Colombian mother from Cali state and the super auto was then stabilised. Super Cali Haze is our first SUPER AUTO and she is a big tall strain which can grow over 2 metres outdoors and produce upwards of 4 ounces. This is perfect for someone wanting to fit 2 harvests into one summer season and still be cropping out before everyone using traditional photo-period strains. Super Cali Haze also works perfectly indoors although some training and tying down may be required to help control her unbelievable growth. 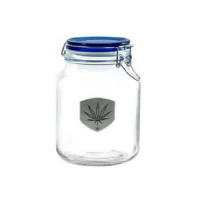 Unlike most autoflowering strains which are indica dominant Super cali-haze is a pure Sativa strain so will give you that soaring cerebral hit you expect from a good old fashioned haze. The aroma of the plant is not too potent but when you take your first hit you will truly experience its wonderful earthy and spicy flavour. The high comes on fast and is uplifting, energetic and incredibly potent keeping you on another level for a good few hours. 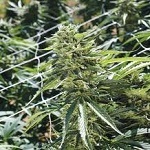 When you come down its without a big bump and super cali haze will not leave you feeling groggy and lethargic.